The new master-plan submission: (1) Harvard Business School’s (HBS) Kresge Hall replacement; (2) Burden Hall replacement; (3) Faculty and administrative office building; (4) Harvard Stadium addition/renovation; (5) Athletics department’s basketball venue and institutional/mixed-use facility; (6) Institutional/mixed-use project (on existing Charlesview site); (7) Hotel and conference center; (8) Renovation of HBS’s Baker Hall; (9) Renovation of Soldier’s Field Park housing. The new plan, when considered with recent and concurrent amendments to the existing IMP (which dates to 1997), largely follows the recommendations outlined by Harvard’s Allston Work Team in June 2011 (see “Rethinking Allston,” September-October 2011), but with some notable—and telling—differences. Proceeding as planned are: the construction later in this decade of a hotel and conference center on Western Avenue (behind the Genzyme building that fronts the Charles River), either by a private developer or in partnership with one; completion, starting in 2014, of a 500,000- to 700,000-square-foot Health and Life Sciences Center (on the foundation mothballed in 2010 when Harvard ceased work on an earlier four-building science complex); and construction, with a development partner, of a 300-bed housing and retail project at Barry’s Corner. In addition, the 2012 plan includes a host of building projects—from renovation to new construction—on and adjacent to the Harvard Business School campus, as well as the construction of a new basketball venue, a vehicular-maintenance and police-training facility, an addition to Harvard Stadium, and two mixed-use institutional buildings (including one on the prominent site near the intersection of Western Avenue and North Harvard Street) that were not part of the original Work Team recommendations. 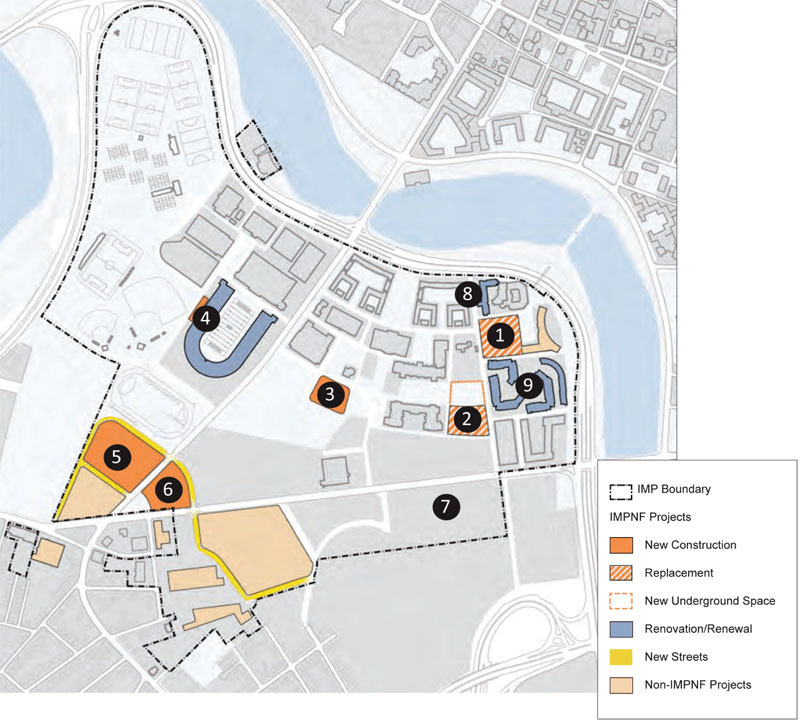 Notably absent from the new IMPNF are plans for an “enterprise research campus,” described in June 2011 as having the potential for 1.5-million to 2.5-million square feet of commercial space. Such a center, perhaps modeled on Research Triangle Park, situated near three universities in North Carolina, would serve as a major technology hub between Harvard and MIT. The site, in the same vicinity as the hotel and conference center, would be in direct competition with the locus of high-tech firms in Cambridge Center at Kendall Square (where MIT last year announced plans to invest $700 million to redevelop its buildings), as well as with new technology-focused developments at the Seaport along the Boston waterfront—challenging alternatives in the current economic environment. That part of the University’s landholdings, and much else on Harvard’s new Allston map, is blank space—for unspecified use well in the future. The net result, at least in the most public-facing locations of greatest interest to Allston residents, is a substantially more modest 10-year undertaking than contemplated even 18 months ago. At 175 North Harvard Street, near the intersection with Western Avenue, Harvard plans a 60,000-square-foot, 3,000-seat basketball arena to replace the existing 1,950-seat Lavietes Pavilion at Briggs Cage, which is the the smallest in the Ivy League. The complex might also include as much as 140,000 square feet of mixed housing, retail, and institutional or commercial office space. Local residents have greeted the proposal with some skepticism: “Sports facilities around Boston tend to be in conflict with the surrounding community. The nature of the evening activity, the parking, the crowds after and before the game—they just rub each other the wrong way,” commented one resident. Existing institutional uses at the North Harvard Street site, including vehicle-maintenance garages, will be moved to 28-38 Travis Street, the proposed site for the police-training facility as well. Another 200,000-square-foot building of unspecified mixed institutional use is planned for the most prominent location within Harvard’s Allston holdings: the site of the existing Charlesview apartments at the intersection of Western Avenue and North Harvard Street. Demolition will begin after apartment residents are relocated, probably in late 2014, to new housing at Brighton Mills, now under construction. The new plan, which adds 27 acres to Harvard’s existing 151-acre Allston campus, plays to fundraising strengths—from the athletics department to Harvard Business School (HBS), where on October 12, dean Nitin Nohria announced a $40-million gift from the Dr. James Si-Cheng Chao and Family Foundation to help replace Kresge Hall with a new 90,000-square-foot executive-education facility (see http://harvardmag.com/chao-13 for more information). The gift comes as construction continues on the $100-million, 150,000-square-foot Tata Hall, a 179-bedroom expansion of executive-education facilities. Tata, the new Ruth Mulan Chu Chao Center, a planned renovation of the 78,000-square-foot Baker Hall, construction of a 130,000-square-foot replacement for Burden Hall, and a new 110,000-square-foot faculty and administrative office building will result in a revitalized HBS campus. Nearby, the 423,000-square-foot Soldiers Field Park Housing complex is slated for extensive renovation in the latter half of the decade.